INTRODUCTION: Intussusception occurs when a proximal segment of bowel telescopes into the lumen of an adjacent distal segment and can occur anywhere within the gastrointestinal tract. With the advent of multislice CT scanner, more cases of intussusception are reported. The purpose of this study was to determine the clinical presentation in cases of adult intussception demonstrated at computed tomography and to correlate the imaging findings with clinical diagnosis and intervention. MATERIALS AND METHODS: Retrospective review of CT images and clinical records of all patients with intussusception demonstrated on CT SCAN images from Jan 2003 to Dec 2008. Patient demographics, Clinical presentation, Imaging findings, length of intussusception, Intervention and outcome were included in this study. RESULTS: 28 pateints were diagnosed with intussusception during the study period . 12 adult patients had one or more incidental intussusceptions demonstrated on CT scan. 4 adult patients had lead points and underwent surgery. The length of intussusception found to be more than 4 cm in patients who required operative intevention. CONCLUSION: A quarter of adult intussuceptions demonstrated at CT imaging were caused by lead point. 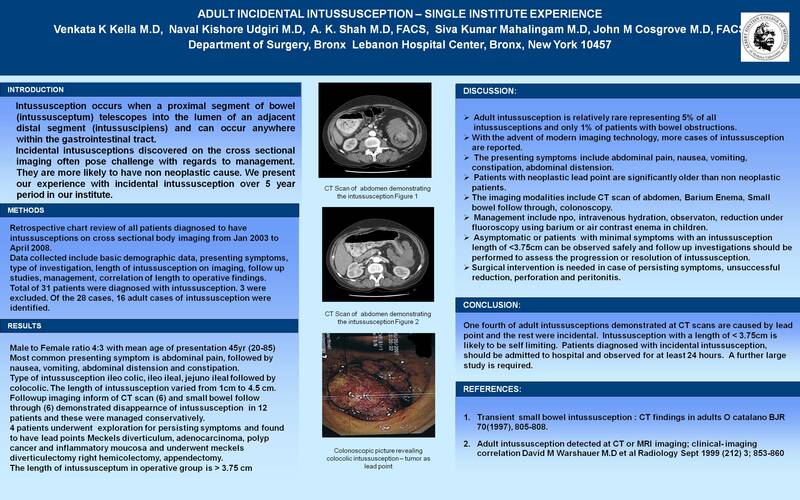 75% of adult intussusceptions in this series were asymptomatic incidental intussusceptions. An intussusception length of less than 4 cm is likely to be self limiting and the patients with incidental intussusception should be admitted for observation.